A variety of changes to the state’s Liquor Control Act were approved this session with passage of LB1105, introduced by O’Neill Sen. Tyson Larson. The bill establishes the Nebraska Craft Brewery Board, which will include seven governor-appointed members who have been involved in the beer industry. The bill also creates the Nebraska Beer Industry Promotional Fund to advance, market and promote the beer brewing process in Nebraska and the agricultural products grown and produced in the state for use in the beer industry. The fund will consist of money credited from beer manufacturer shipping licenses and a $250 annual fee for craft brewery licensees. • harmonizes the excise tax rate and makes the statute applicable to wholesale and manufacturing licensees, not just retail licensees. The bill contains provisions of two additional bills. LB748, originally introduced by Omaha Sen. Brett Lindstrom, allows an individual to import alcohol—up to 108 liters per calendar year—for personal use from a holder of a retail direct sales shipping license or its equivalent. LB1046, originally introduced by Crete Sen. Laura Ebke, allows a Nebraska resident who is legally able to work in the state to be eligible for a liquor license regardless of U.S. citizenship. The bill passed on a vote of 45-2. Two gaming proposals were advanced from committee but stalled during general file debate. 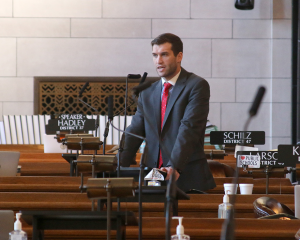 The first, an omnibus bill that would have changed provisions of several gaming rules in Nebraska and regulate fantasy sports contests, was tabled at the request of the introducer. LB970, as introduced by Larson, would have allowed any form of payment in U.S. currency under the various state acts that govern bingo, pickle cards, lotteries and raffles. Currently, only cash is allowed for keno transactions. Among other provisions, the bill would have allowed more flexibility for pickle card operators and eliminated the mandatory five-minute wait time between keno games. A General Affairs Committee amendment would have stricken the provision eliminating the five-minute wait between keno games. The amendment also would have incorporated provisions from two additional bills. Provisions from LB820, originally introduced by Venango Sen. Dan Hughes, would have allowed a lottery or raffle in which the winners are determined based on the timing of a naturally occurring event, such as a weather event. Provisions of LB862, introduced by Larson, would have codified fantasy contests in Nebraska law. The provisions would have applied only to operators who offer fantasy contests for cash prizes to the general public upon payment of an entry fee. A motion to bracket LB970 was pending when Larson requested that the bill be placed on hold for the remainder of the session. After extended general file debate, an attempt to force a vote on a bill that would have granted the state taxing and regulatory authority over community card games failed. LB619, introduced by Larson, would have authorized the state Liquor Control Commission to oversee licensing for two types of poker games—draw and community card games. The bill defines community card games as those, such as Texas Hold’em, in which a player combines the cards he or she is holding with community cards that all players share. Under the bill, current liquor licensees and nonprofits that otherwise would qualify for a special designated liquor license could have applied for a poker endorsement or a special designated poker license for events on or off the licensee’s premises. After six hours of debate, Larson offered a motion to invoke cloture—or cease debate and force a vote on the bill and any pending amendments. The motion failed on a vote of 16-29. Another gaming measure was indefinitely postponed by the committee on a 7-1 vote. LR380CA, introduced by Hoskins Sen. Dave Bloomfield, would have placed a proposed change to the division of lottery proceeds on the next general election ballot. • decreased from 10 to 7.5 percent the amount designated to the Nebraska State Fair Board. Finally, LB969, sponsored by Larson, would have allowed all municipalities in the state to choose whether libraries within their community are governed by a board that is part of city government or by a separate advisory board. The bill was considered by the committee but was not advanced to general file.